In 2010, as we lifted off the runway in Guayaquil, Ecuador and banked toward Baltra in the Galápagos Islands, some six hundred miles away, I still didn’t know what to expect. I had dreamt of this moment for decades, but wondered if reality would match presumption. “This is your “leg” of the journey,” she said. She was referencing a promise made to ourselves forty years earlier, when the relationship was new. We had spent the last eight days in the Peruvian Andes fulfilling her dream of walking in Macchu Picchu and the Sacred Valley. “What’s on your mind?” she asked. “Sally Lightfoot crabs,” I said. and the pads, after falling to the ground are devoured by the large land iguanas. The first ferry ride was less than one mile, the distance between Baltra and Santa Rosa Islands. The initial arid landscape quickly became a translucent turquoise blue bay inlet with visible sea life, surrounded by coal-black volcanic rocks. red period before assuming, as adults, gleaming red legs and a dazzling yellow shell with piercing sky blue trim. Santa Cruz Island was more tropical than the others. It is also home to the giant domed tortoise that thrives inland from the water that bears its name. Baie Tortuga is along the route to Puerto Isidro Ayora, where “Carmina,” our nautical home for the next five days, was “anchor down,” awaiting our arrival. An opportunity to observe these gentle giants was enough to delay the rendezvous. stupendous creatures once being slaughtered for fresh meat on pirate ships. The giant tortoises were mesmerizing. We could have watched all day but needed to be in port soon. As the bus was departing down a dirt road, it suddenly stopped as Pauli, our naturalist, stood up. “Well, my friends. It seems that one of the tortoises has decided to rest in the middle of the road,” she said. “What happens next?” John asked. Any physical contact with the tortoises is strictly forbidden and closely observed. We waited for fifteen minutes before Pauli stood once again. “I need volunteers,” she said. With limited visitations closely monitored by the Conservancy, she understood the need to remain on schedule. “I’ll do it,” I said, my arm already raised like a fifth grader who knows the right answer. Seconds later, six of us carefully surrounded and, with near perfect precision, lifted the giant domed tortoise and moved it several feet off the muddy road. It remained quiet and still during the process but, once on the ground, became the fastest slow-mover of the day. Other islands are home to the saddle tortoise whose shell is arched to provide more neck reach to the prickly pear flower, food that hangs three to four feet above the ground. 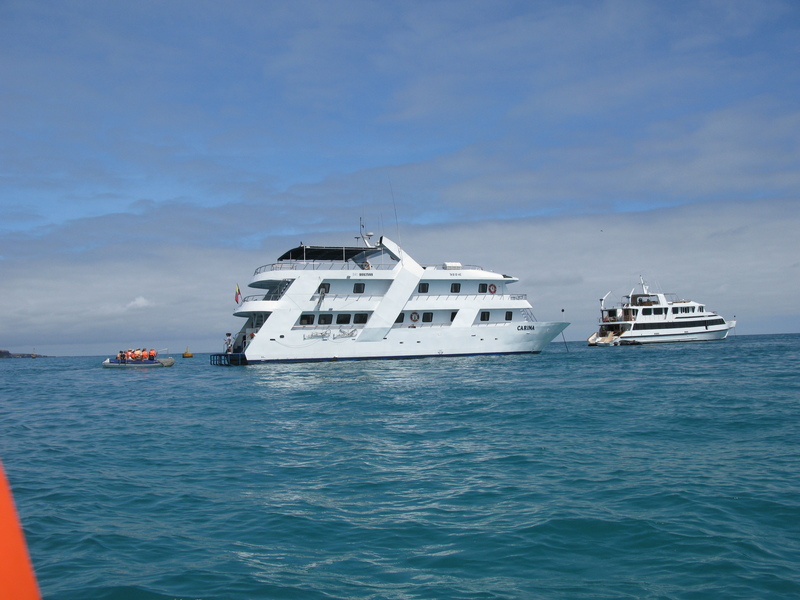 Puerto Isidro Ayora, Galapagos’s largest town with a population of thirty-thousand, is the main port for all cruise vessels. As our group of fifteen boarded two rubber Zodiacs for the half-mile journey to the small cruise ship, a discussion ensued regarding people’s diverse expectations. Some were fulfilling lifelong dreams, others were being dragged along by their partners. I tuned out, put aside any perceptions and immersed myself in the moment. I was sitting in a rubber raft with a motor attached, in the sea of the archipelago, at the confluence of the three oceanic currents that created this ecosystem. Settled in on Carmina, we enjoyed a welcome toast with pina coladas and a wonderful dinner prepared by chef Raoul, our new favorite crew member. We all went to bed early, hoping to sleep through our first night of sailing. 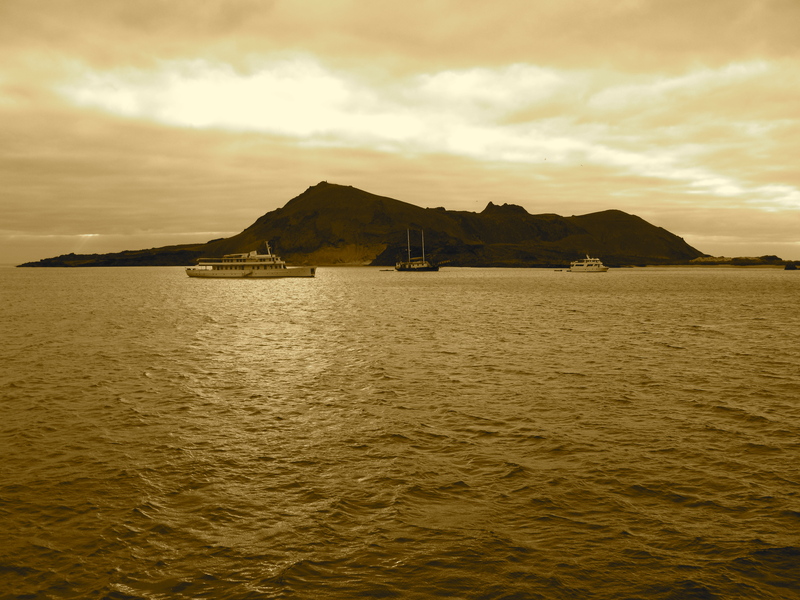 The last sound I heard was the anchor lifting through the water as we departed for Bartolome’ Island, a volcanic rock with minimal plant or animal life. would see many more fish along with sea lions, marine iguanas, eels, rays and sea turtles during our daily snorkeling adventures. After lunch on the boat, we were back on the Zodiacs, patrolling the volcanic cliffs in search of the shy Galápagos penguins, hiding among the fluorescent Sally Lightfoot crabs and a few Blue-footed Boobies. Measuring twenty-four inches high, these rare docile penguins are the second smallest of the species that, once in the water, become quick and agile. Day Two began with a dry landing on Puerto Egas, a lava beach on Santiago Island, and a hike where we encountered large colonies of sea lions, marine iguanas and, of course, more Sally Lightfoot crabs. The volcanic cliffs led us to a flat plateau filled with tide pools and ledges near the surf, providing protected water access for various species. 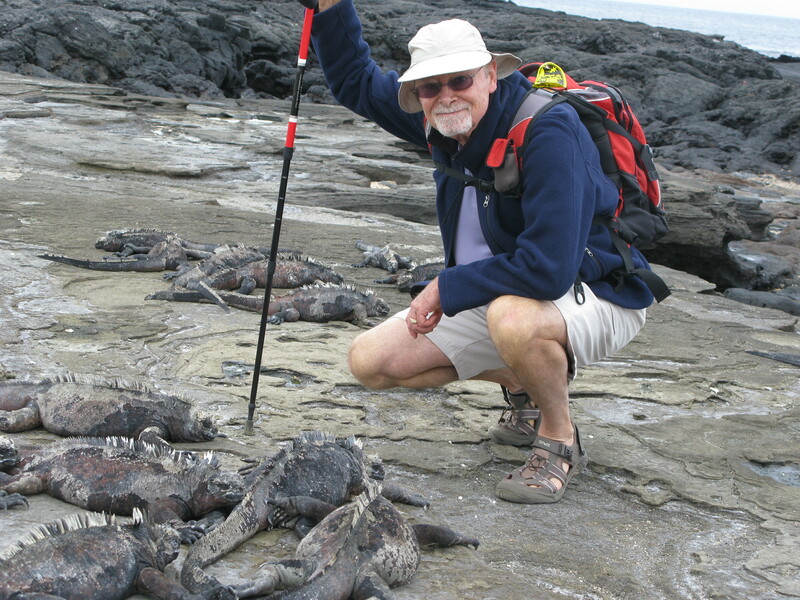 Hundreds of prehistoric looking marine iguanas appeared as we reached the ledge, lying side-by-side and on top of each other, oblivious to our invasion. Aside from the occasional snort, ejecting the salt acquired on their latest ocean sojourn to eat red and green algae and cool their bodies, they seemed lifeless. Over the next hour, we observed the lethargic creatures sunning themselves until the necessity to repeat the cycle drove them to the sea. the fourteen species of finches found on the islands. After snorkeling in a small bay abundant with sea turtles and rays, we returned to the boat for lunch as it navigated toward Rabida Island for our first deep-water snorkeling off the Zodiac. The timing for this jaunt was perfect for observing the last lunch call for hundreds of Blue-footed Boobies, innocent-looking, lumbering birds with iridescent turquoise duck-feet that, once in the air, became missiles, diving into the surf with the force and synchronization of the Blue Angels air acrobatic team. Gathering and hovering high above for several minutes, there was a “caw” to action from the leader and suddenly they released, hitting the water like bullets from a semi-automatic rifle. None of them went back to the cliffs hungry. Using a backflip off the Zodiac like a scuba diver, Rod was the first in the water. Before I entered, he reappeared, emphatically pointing to a specific location. “Look down now,” he said. Off the boat, after adjusting my mask, I put my face in the water in time to see two marine iguanas feeding on algae. Watching them smoothly sway back and forth through the water as they swam to the surface was hypnotic, the spell broken only by a large sea turtle passing within arm’s reach. The five of us who chose to join the first deep water snorkeling were rewarded well beyond our expectations. Back to the boat to remove our wetsuits, we quickly re-boarded the Zodiac dinghies and crossed the inlet for a wet landing on Rabida Island that promised red sand beaches and large colonies of sea lions. With uniquely gorgeous beaches, the small Rabida Island revealed a landscape of low to medium shrubs and prickly pear trees that vibrantly contrasted with the red sand and soil. 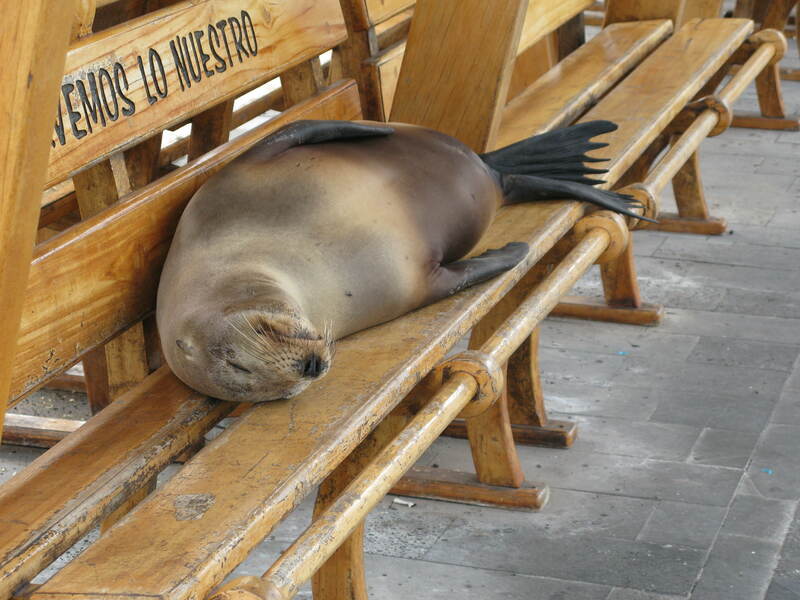 It was there that we first observed the dictatorial alpha male sea lions rule their harems with an iron flipper, lashing out against other interested males or females with a wandering eye. Thrusting out one’s chest and yelling stridently is, apparently, required to maintain their power or overcome the fear of losing it. I have heard recent rumors that the females have initiated a #MeToo! movement that is wreaking havoc on the entire eco-system. display when they were hunting fish. After dinner on the boat, we set sail to South Plaza Island, a small patch of land, that unlike Bartolome Island, promised distinctive terrain and wildlife. The early morning rumpling of a dropping anchor signaled that we were close to land. South Plaza Island required a wet landing because the minuscule strips of sand immediately ascended to steep rocks that were carefully crossed to reach the effervescent scarlet and yellow Sesuvium, a succulent ground cover that surrounded a dirt trail. A short walk led us to steep, vivid cliffs that afforded close-up views of fierce blue-green surf and Elliot’s storm petrel, a long-legged bird that flies close to the rocks with uncomprehending speed and agility. 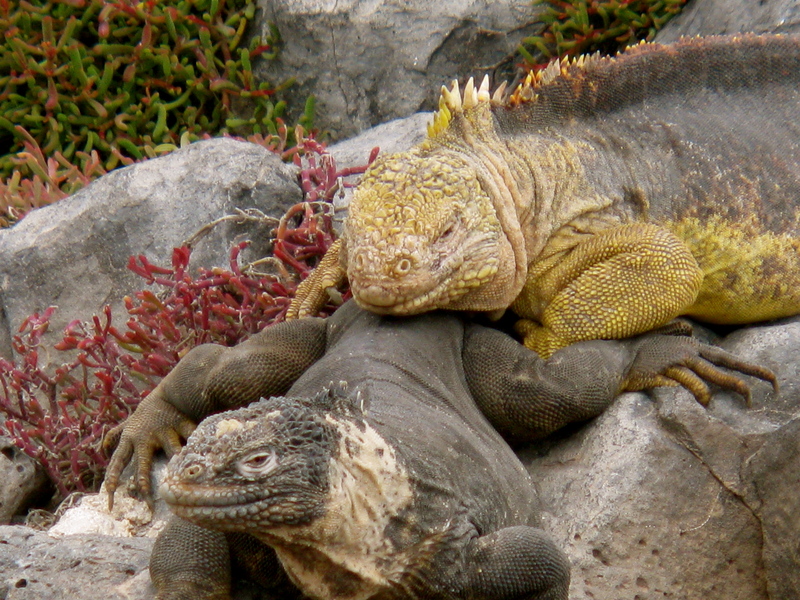 The male land iguana that resides on South Plaza Island is also unique, displaying lurid colors to attract females during mating season. The ones we encountered were two to three feet long with bright yellow scales that resembled an ear of corn. Karen carefully photographed them from all angles and was rewarded when a female arrived for some companionship. Aware of this rare opportunity, she continued to shoot, mindful of the purity and dignity of the moment. A lasting memory from this small island, thriving with life, was watching the birth of a baby sea lion and what followed. A large sea lion was lying on the rocks a few yards away. Pauli pointed skyward to a large flock of frigate birds that hovered above like hawks over their prey. Minutes later, the pup was born. The mother immediately nudged it away from the afterbirth toward the sea, anticipating that the frigates would soon dive in numbers for the unusual meal. The dynamics of the scene were astonishing. The acrobatic, hungry frigates, the protective sea lion mother and the pup, trying to comprehend “womb to water,” was mind-boggling to watch. Something else mind-boggling happened that evening on the boat during dinner. 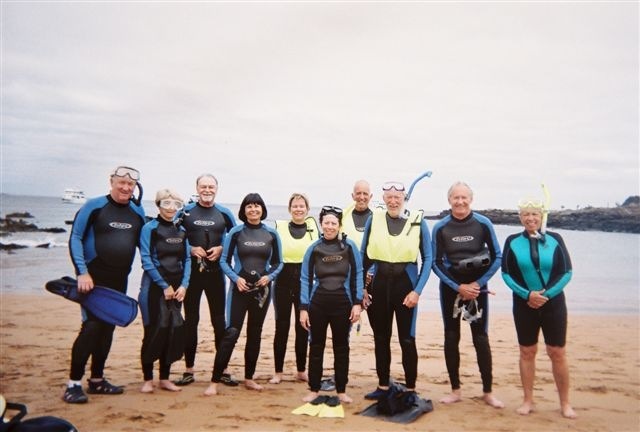 We sat with another couple, Tom and Carol who, although we had snorkeled together in the group, we had not spoken to. “I was born in Santa Monica, but I grew up in Sunnyvale,” said Karen. Once again, I slipped into the moment. What were the odds? We were sitting in the galley of a small cruising ship, somewhere in the Galápagos Islands, and Karen was talking to a new friend who happened to be very old friend. Months later, Tom and Carol traveled down from Oregon and we attended a Homestead High School reunion together, days after the death of its most famous alumni, Steve Jobs. the pellucid waters of Darwin’s Bay. A wet landing was required on a beach alive with sea lion activity, which nearly caught one of our group in a compromising position between an angry alpha male and an unwelcome intruder. Amid some loud barking and a few aggressive gestures, the situation was soon peaceably resolved. It seems that the alpha male will defend his harem against outsiders of any species. The other memories of Santa Fe Island came from below the ocean’s surface. After a deep-water entry off the Zodiac, we snorkeled the bay, identifying three rays—spotted eagle, diamond and sting—more sea lions, eels, multitudes of fish and graceful sea turtles methodically swimming by. Plants and sea life created a striking visual underwater panorama that has remained a vivid memory. Chef Raoul outdid himself with a sublime farewell dinner. Afterwards, we all enjoyed an aperitif and talked about our experiences and our expectations. Most were met, some not. The few people that chose not to get into the water or the Zodiacs would have enjoyed a luxury cruise more. Atypically, I mostly remained silent during our discussion, choosing to maintain the purity of my personal insights. 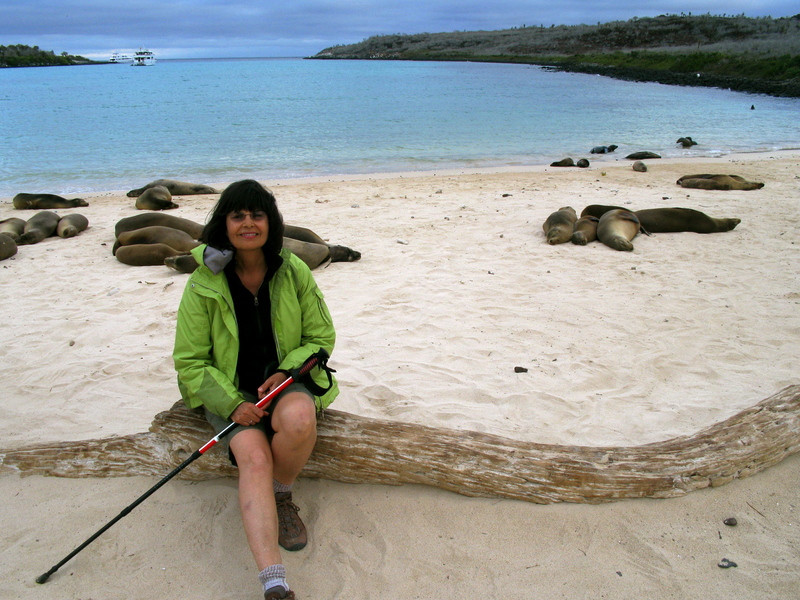 Although I detest the term “bucket list,” exploring the Galápagos Islands was something that I always planned to do during my lifetime and I had a sense of fulfillment. was a dream job. Truly, we all appreciated how hard she worked. Her patience and knowledge enhanced the adventure more than we could have imagined. There was a light storm during the final sail to Puerto Baquerizo Moreno on San Cristobal Island. Needing the help of the guide rails to get our clothes from the dresser to the suitcase, choppy waters made us wish that we had completed packing before dinner. Our bags managed to get outside the door by the 6 am deadline and soon we were on the Zodiacs for our final ride to enjoy the village before departing for the Ecuadorian coast. benches. It was a metaphor for the way of life on the islands where an “everything matters” viewpoint is engrained into the culture. 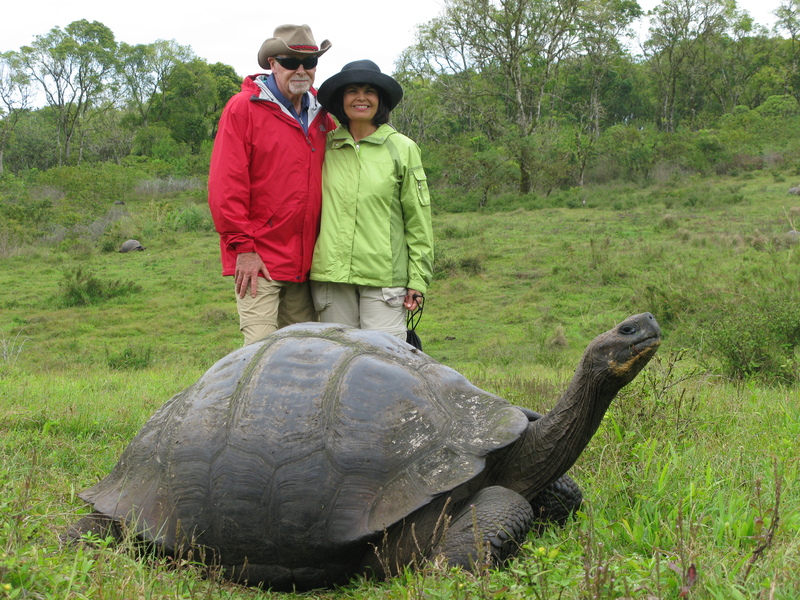 Few have had the opportunity to experience Galápagos and fewer are capable of grasping it the way Charles Darwin did. My resolve to stay in the moment helped me immerse myself into it and take what it was giving. The memories, and the way it enhanced my perspective of the world, will last forever. As we lift off the runway in Guayaquil, Ecuador and bank toward Baltra in the Galápagos Islands, some 600 miles away, I still don’t know what to expect. I have dreamed of this moment for decades, but still wonder how the experience will match my expectations. Hopefully, I can put aside anticipation and focus on the moment. Stepping onto Galápagos soil, my first reaction was, “Did I just see a Joshua Tree? Proceeding through customs in a building without walls, covered only in thatch, with no lines is nearly stress free. A good beginning. Soon on the bus for the three-mile trek to our ferry, I got my first glimpse of the Prickly Pear tree, resembling the shape of the Joshua tree with large, flat, prickly pads. An abundant and vital part of the Galápagos landscape, the flowers of the Prickly Pear feed the giant tortoises and the pads, after falling to the ground, are devoured by the land iguanas, “prickles” and all. The first ferry ride was less than one mile, the distance between Baltra and Santa Rosa Islands. The initial arid landscape was now mitigated by this stretch of turquoise sea with visible sea life. I’m here. Stepping off the ferry on Santa Cruz Island, one of the largest in the Archipelago, my eyes caught a Sally Lightfoot crab scurry across the volcanic rocks. Hoping to see some of these colorful, animated creatures during the trip, my guess was that over 150,000 crossed our paths during the next four days. They were everywhere, their vibrant pigments contrasting the black rocks. The babies are black for protection; the adolescents transform through a red period before assuming, as adults, a myriad of visually sensational colors. “Carmina,” our home for the next four days, was “anchor down,” awaiting us. Only the gentle giants of this island are reason to delay our rendezvous. A short hike off the road, into a large, lush meadow led to our first glance of the giant dommed tortoise. Everyone’s eyes locked on the first creature, within seconds we distinguished 15 or so quietly eating the meadow grasses. A few of the gentle giants withdrew into their shells as we passed, but most went about their normal routines of ingesting without chewing to begin the three-month digestive process. With shells waist-high to a normal adult and often six feet long, head to tail, it’s hard to comprehend these stupendous creatures once being slaughtered for fresh meat on pirate ships. The necessity to perform the forbidden led to one memorable experience. As we departed, the bus encountered a very large tortoise resting in the middle of the road. We waited patiently for a few minutes before our naturalist, Pauli, announced that we had a boat to catch and sought volunteers to lift and relocate him. Six of us carefully, with near precision, lifted the creature and moved him several feet off the road. This experience was followed by observing, clearly the fastest moving of all tortoises. Other islands are home to the saddle tortoise, whose shell is arched to provide more reach to the Prickly Pear flower, food that hangs three to four above the ground. 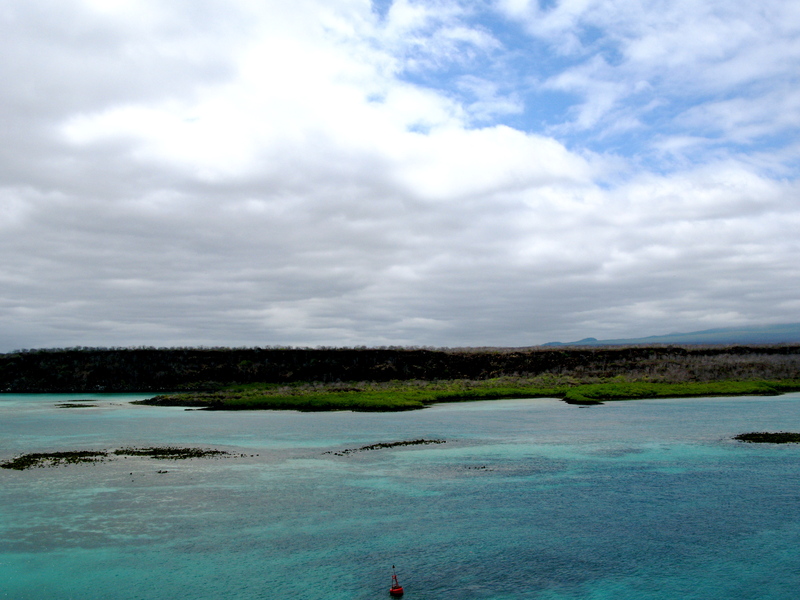 Puerto Isidro Ayora, Galapagos’ largest town with a population of 30,000 is a main port for all cruise vessels. As our group of 15 boarded two zodiacs for the half mile journey to our small cruise ship, a discussion of our diverse expectations ensued, some fulfilling life-long dreams, others being drug along by their spouses. Once again, I put aside perceptions and immersed myself in the moment. After an onboard toast with pina colatas and a wonderful dinner prepared by our chef, Raoul, we went to bed early, hoping to survive the movement of the boat as we lifted anchor and cruised north to Bartolome’ Island, a volcanic rock with minimal plant or animal life. On the zodiacs by 8 am, we departed for the island and a challenging hike up some 400 steps through the lava beds to the top, followed by snorkeling in a small cove in Sullivan Bay, directly below the majestic, wind-carved Pinnacle Rock. 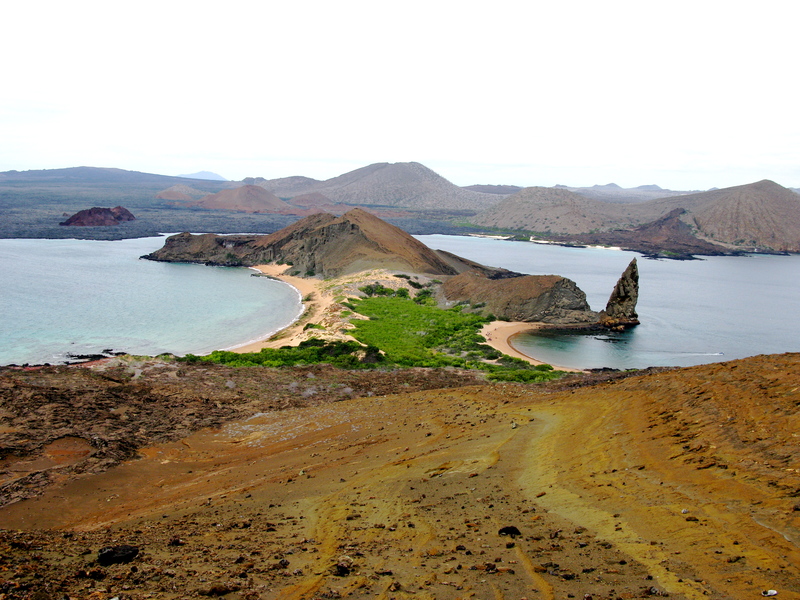 Views from the top of Bartolome’ Island and below the ocean’s surface were stunning, the latter courtesy of a huge school of Yellow-tail Surgeon Fish. We would see many more fish, along with sea lions, marine iguanas, eels, rays and sea turtles during our daily snorkeling adventures. After lunch on “Carmina”, we are back on the zodiacs, patrolling the volcanic cliffs in search of the shy Galápagos penguins, camouflaged by the rocks, amongst the fluorescent Sally Lightfoot crabs and a few Blue-footed Boobies. At twenty-four inches, these rare penguins are the second smallest of the species, generating tremendous speed and agility once in the water. 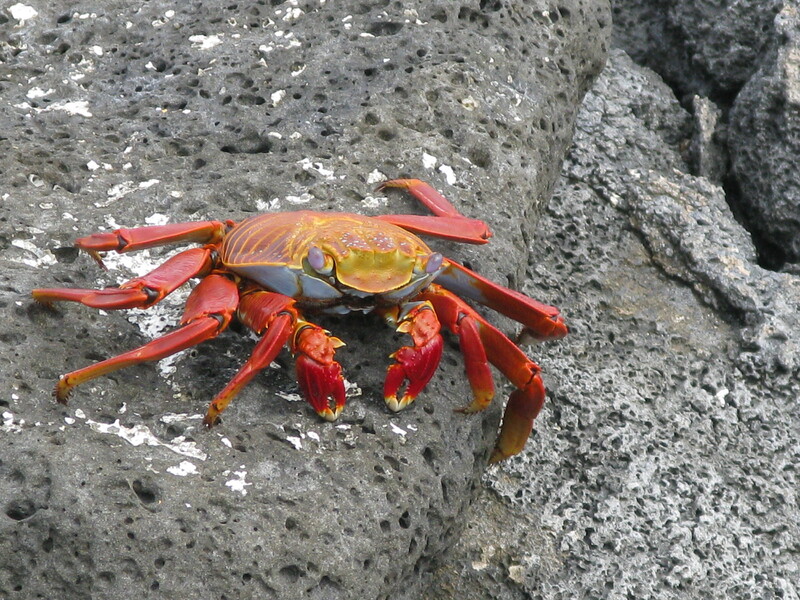 Day 2 began with a dry landing on Peurto Egas, a lava beach on Santiago Island and a hike encountering large colonies of sea lions, marine iguanas and, of course, more Sally Lightfoot crabs. 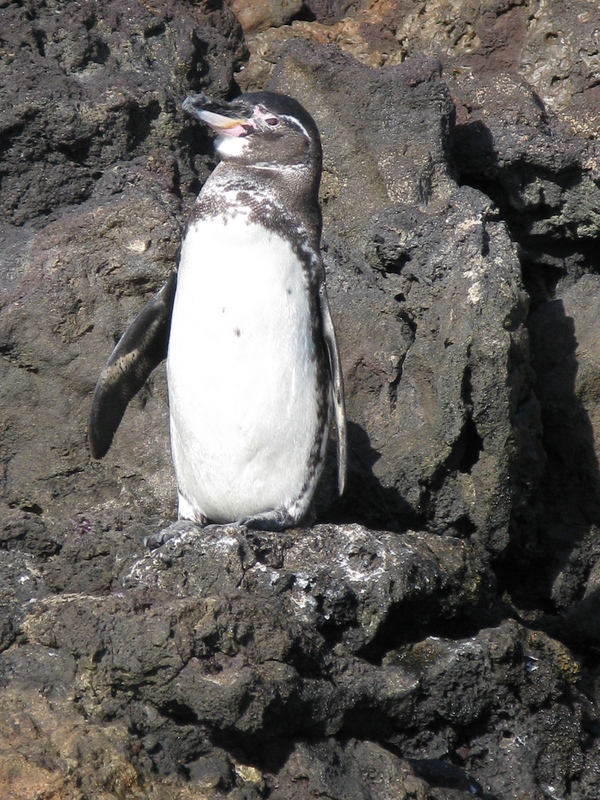 The volcanic cliffs led us to a flat lava plateau, filled with tide pools and ledges near the surf, providing protected water access for the sea lions and marine iguanas. Hundreds of prehistoric looking marine iguanas appeared on the ledge, laying side by side and on top of each other, somewhat oblivious to our invasion. Aside from the occasional snort, evacuating the salt from their latest ocean sojourn to eat red and green algae and cool their bodies, they seemed somewhat lifeless. On a stakeout, we observed these lethargic creatures sunning themselves until the necessity to repeat the cycle drove them to the sea. tropicbirds, brown pelicans, flightless cormorants, Galápagos hawks, lava herons, and many of the 14 finches found on the islands. Following snorkeling in a small bay, abundant with sea turtles and rays, we returned to the boat for lunch and navigation to Rabida Island for our first deeper water snorkeling off the dingy. The timing for this jaunt was perfect to observe the last lunch call for several Blue-footed Boobies, innocent looking birds with striking turquoise feet that, once in the air, become missiles, driving into the surf with the force and synchronization of the Blue Angels. lions rule their “harems” with an iron fist, against other interested males and females with a wandering eye. Thrusting out one’s chest and yelling stridently is, apparently, required to maintain their power; machismo a bit over the top for my tastes. On the return trip to “Carmina,” the drivers meticulously maneuvered the dingy close to the rocks of the minute Nameless Island for close observation of Blue-footed Boobies nesting on the rocks. The resting birds did not seem to fit their air acrobatic profile on display when they were hunting fish. Back on the boat for dinner, we set sail to South Plaza Island, a small patch of land a few hundred meters east of Santa Cruz Island that promised unique terrain and wildlife. The 6 am rumpling of a dropping anchor signaled that we were somewhat close to land. 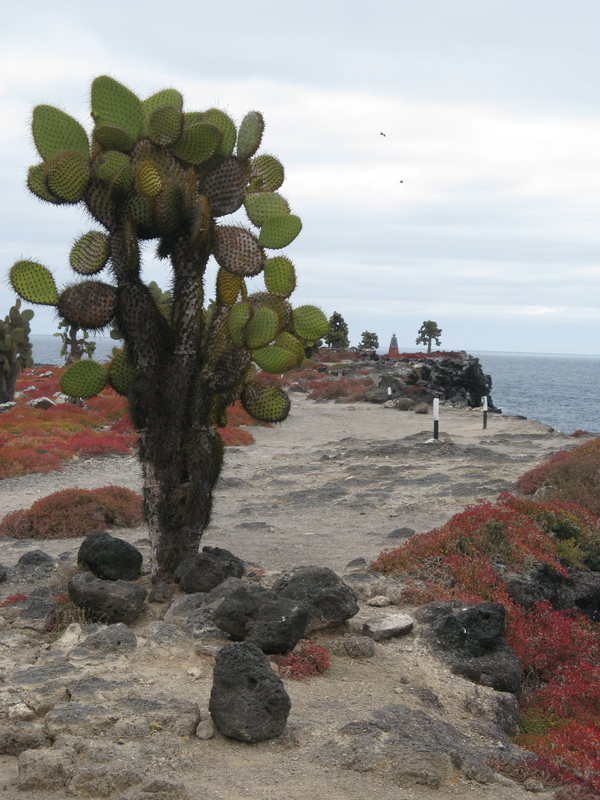 South Plaza Island required a wet landing because the minuscule strips of sand immediately ascended to steep rocks that we carefully crossed to reach the effervescent scarlet and yellow seauvium succulent ground cover, contrasting the dramatic Prickly Pear trees. The trails led to steep, vivid cliffs, affording views of fierce blue-green surf and Elliot’s storm-petrel “galapagosensis,” a long-legged bird that stays close to land, accentuating its speed and agility. bright yellow with scales resembling an ear of corn. Karen carefully shot them from all angles, and then was rewarded when the female arrived for some quality time. One lasting memory from this small island, thriving with life, was watching a mother sea lion and newly born pup. Pushing the pup away from the after-birth, toward the sea, she anticipated that the frigate birds would soon come in numbers for the unusual meal. The dynamics of the whole, the acrobatic, hungry frigates, the protective sea lion mother and the pup, trying to comprehend “womb to water,” was mind-boggling to watch. Back to the boat for lunch and some relaxation as we sail to Santa Fe Island, our last exploration of this miraculous place. 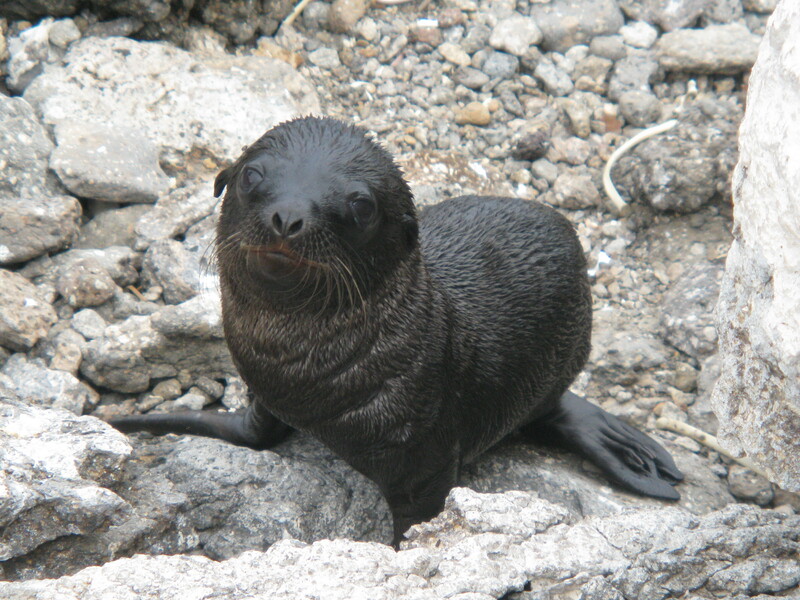 Our time on Santa Fe, one of the oldest of the Galápagos Islands, began as the dingy entered the translucent waters of a small bay, leading to a wet landing on a beach with abundant sea lion activity that nearly caught one of our group in a compromising position between an angry alpha male and an unwelcome male intruder. Amidst loud barking and some aggression by the alpha male, the situation was soon resolved as the female of interest accepted her fate. The unforgettable wildlife of Santa Fe was beneath the ocean surface. After a deep water entry off the dingy, we had the time to “snorkel” the bay, identifying three rays, spotted-eagle, diamond and sting, sea lions, eels, multitudes of fish and the large, graceful sea turtles methodically flying by. Quayaquill on the Ecuador coast. 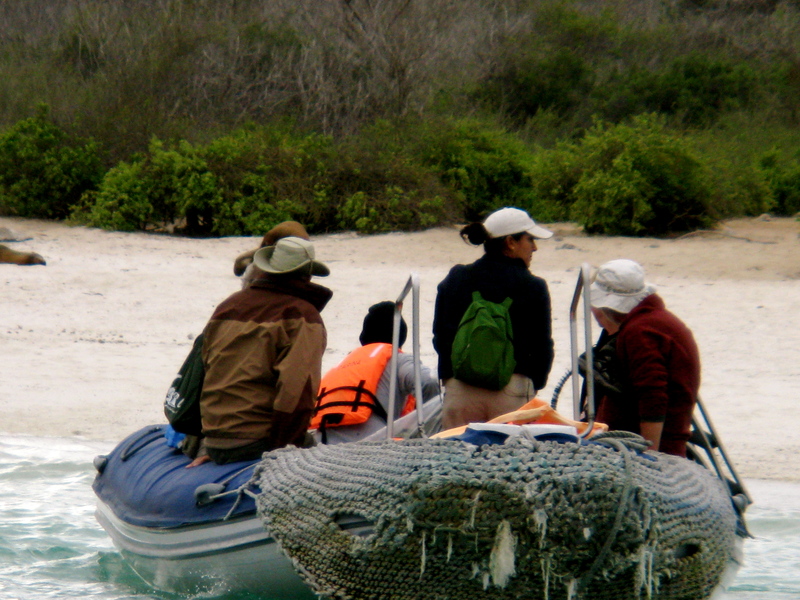 The Galápagos experience was ending, the memories beginning. We came upon more plant and wildlife imaginable, swam in its oceans and witnessed the results of volcanic eruptions. A lifetime of activity condensed into five days. After eating like a horse the entire trip, I returned home from Peru and Galápagos six pounds lighter. While the regiment doesn’t require one be a marathon runner, some physical preparation is required. It’s definitely worth the gym time.